Doctor Who Meets Sherlock Holmes In THE TALONS OF WENG-CHIANG | Warped Factor - Words in the Key of Geek. 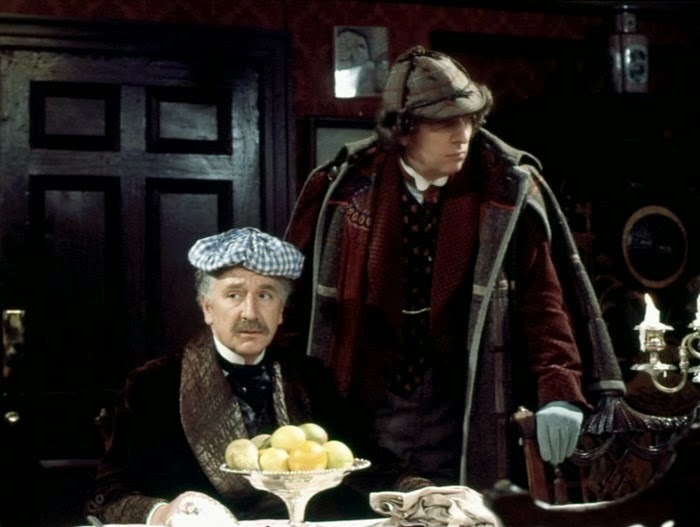 Christopher Morley looks at the many Sherlock Holmes influences scattered throughout the Doctor Who story, The Talons Of Weng-Chiang. Take a bracing walk through the fog of late eighteenth century London as we go hot on the trail of the mystery of The Talons Of Weng-Chiang, paying particular attention to one key detail- the influence of Sir Arthur Conan Doyle's Sherlock Holmes. 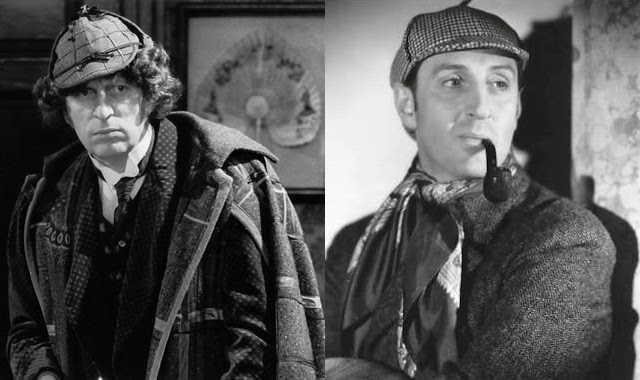 It would seem Holmes shares a housekeeper with Professor Litefoot, too! "Ah, now, let's see what we have here. Mrs Hudson always leaves me a cold collation." No time to sit down & eat it though- there's a mystery to solve! Enigmatic Oriental magician Li H'Sen Chang is suspected of having a hand in the strange disappearances of several women, though some speculate it could be the work of the notorious Jack the Ripper......theories abound as to his true identity even now. CASEY: Oh, it says in the paper how it could be jolly Jack at work again. CASEY: The Ripper, Mister Jago. JAGO: The horrendous hyperbole of Grub Street, Casey. JAGO: Newspaper gossip. They're probably just stony and scarpered. Cut along now. I'll wait for you here. KYLE: Place of residence, sir? LEELA: We've only just arrived here. DOCTOR: We're on our way to the theatre, do you see. KYLE: Your home address will do for the moment, sir. You do have a permanent address, sir? DOCTOR: No, Sergeant. We're travellers. KYLE: I see. Persons of no fixed abode. DOCTOR: No, no, no, no. We do have an abode. It's called a TARDIS. DOCTOR: But it's not fixed. KYLE: I can give you and the young lady a fixed abode, sir. Quite easily. KYLE: What was that, sir? DOCTOR: It was nothing complementary. Get on with it, Sergeant. KYLE: Now look, sir. We've got our hands full here, all these girls going missing in the manor, so if you'd just oblige us by answering any questions we'll get on a lot better. And a lot quicker. DOCTOR: Sergeant, all this is irrelevant. I've come here to lay evidence. KYLE: We'll come to that in good time. DOCTOR: We'll come to that now, Sergeant. We've just prevented a kidnapping, a robbery or even a murder. My friend here caught one of the attackers. Let's come to it now, shall we? KYLE: We've only your word as to what he did, Doctor. DOCTOR: Tell him. Tell him. LEELA: The man they were carrying was dead. He had been stabbed through the heart! KYLE: Really, Miss. And how can you be sure of that? LEELA: I am a warrior of the Sevateem. I know the different sounds of death. Now put our prisoner to the torture! KYLE: Well, if that don't take the biscuit. Torture, eh? This isn't the Dark Ages, you know. KYLE: He's a Chinese, if you hadn't noticed. We get a lot of those in here, Limehouse being so close. Him jaw-jaw plenty by and by, eh, Johnny? I've sent for an interpreter. DOCTOR: That won't be necessary. I speak Mandarin, Cantonese, all the dialects. KYLE: Yeah, very remarkable, I'm sure, Doctor, but since you're a party to the case, it isn't proper. KYLE: Now what? That come from the river. DOCTOR: Sleep is for tortoises. LITEFOOT: Any news of Miss Leela? LITEFOOT: Perhaps we should inform the police? DOCTOR: No, there are already nine missing girls on their list. LITEFOOT: Oh yes, but surely missing under very different circumstances. DOCTOR: No. If my suspicions are correct, then I know what those poor girls were used for, and I can't imagine a more grisly fate. He's a blackguard. DOCTOR: I don't know who's a blackguard. Some slavering gangrenous vampire comes out of a sewer and stalks this city at night, he's a blackguard. I've got to find his lair and I haven't got an hour to loose. Look. You see? I've been trying to trace the line of the sewers. That's the Thames, this is the line of the Fleet, and that is the Palace Theatre. LITEFOOT: I'm beginning to see what you're getting at. LITEFOOT: Yes, well, er, if you've finished with the tablecloth, I think I'd better dispose of that before my housekeeper arrives. LITEFOOT: How'd you know the course of the Fleet? It's been covered for centuries. DOCTOR: I caught a salmon there once. Would have hung over the sides of this table. Shared it with the Venerable Bede. He adored fish. DOCTOR: Professor, you don't happen to have an elephant gun, do you? LITEFOOT: Elephants? Why on Earth do you want an elephant gun? DOCTOR: We're about to embark on a very dangerous mission. 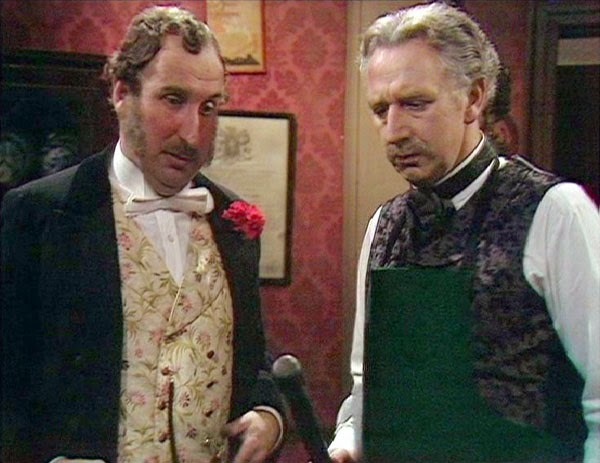 LITEFOOT: Well, I've a Chinese fowling piece if that's any good. Used for duck, mainly. DOCTOR: Made in Birmingham. Yes, that's the main requirement. Could you get me a small boat? LITEFOOT: I imagine so. May I ask the purpose of these preparations? DOCTOR: Yes. To find the confluence of the Thames and Fleet, Professor, then to follow the Fleet. DOCTOR: Oh, and then we shall see. "Matilda Briggs was not the name of a young woman, Watson, ... It was a ship which is associated with the giant rat of Sumatra,a story for which the world is not yet prepared." Oddly reminiscent of the beast ''ten feet from whiskers to tail. '', no? We can also make the case for another dip into literature of a very different sort in that of Magnus Greel. If we consider several of the key circumstances behind his appearance here it becomes apparent that writer Robert Holmes just might have been thumbing through Gaston Leroux's Phantom Of The Opera! 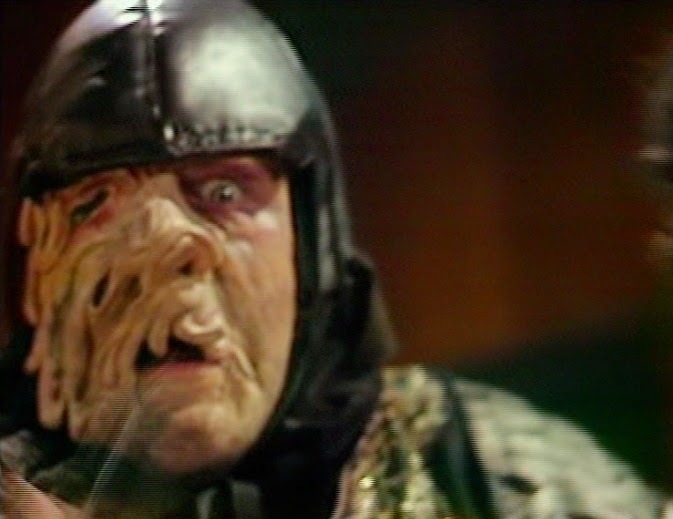 Think about it- a hideously deformed face hidden under a mask, a lair deep in the bowels of a theatre & the revelation of his true self after the aforementioned mask is removed.